Super soft cotton slub long sleeve tee. The gold in the shield has a subtle, eye catching metallic sheen! Kenyon shield inside of Ohio outline. These high quality Nike tights have a great black cutout, Kenyon detail and classic Nike swoosh. Perfect for work-outs! This Nike Dri-Fit piece wicks moisture away and stays cool when your workout heats up! The embroidered front emblems add a special touch to this high quality sweatshirt. This high quality Nike polo has DRI-FIT technology, wicking away moisture and keeping you comfortable! 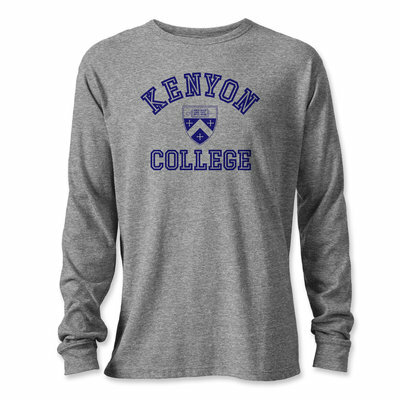 "Kenyon College" arched text and a classic Nike Swoosh make this polo perfect for many occasions. Style up for training with the Nike Pro Short. Made with Dri-FIT® technology, this training short pulls sweat off skin to keep you cool and dry. 80% polyester/20% spandex. 5" Imported. The Nike® Women's Pro Sports Bra is a classic design that gives locked-in comfort. This bra is features the sweat-wicking power Dri-FIT® fabric to keep you dry and comfortable during medium-impact exercise. Its dual-layer construction with an underbust band delivers a compression fit and lightweight support, while the racerback allows a wide range of motion. Get the right coverage for your training with this Nike® Pro Sports Bra. This high quality Nike polo has DRI-FIT technology to wick away moisture and keep you looking fantastic! 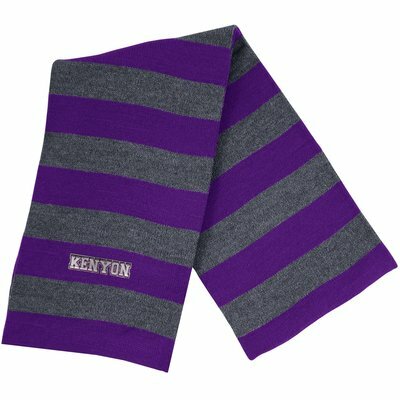 Oxford tee shirt with purple screenprinted "KENYON". 90% Cotton, 10% Polyester.